Local food brands are trending and sales are rising. Recent trips through grocery stores in the South and Northeast show that supermarkets are working hard to capitalize on the trending popularity of local food brands. 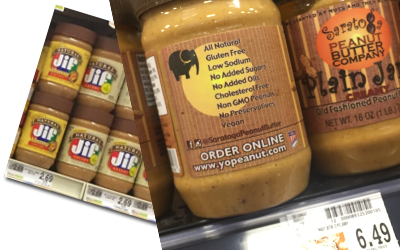 Walking through the peanut butter section in Market 32, the rebranded Price Chopper store in upstate New York, we found it odd not to see many local or regional food brands represented. Later we realized why. Local foods were present. However, they were sequestered in what’s basically a mini “store within-a store”–a local foods boutique section at the store’s front-center near the checkout aisles. All Alone on an Island? I have mixed feelings about this. It’s nice to see the Market 32’s dedication to regional food companies in making sure they are highly visible. At the same time, I wonder if it expects too much self-eduction on the customer’ behalf. This local peanut butter option makes customers work too hard to understand its $4 price difference. For instance, what if I already decided on my peanut butter in the regular peanut butter aisle. Later, I come across other peanut butters in the mini local food brands section. Is it my job to remember that I grabbed Jif Natural at $2.45 when I am now contemplating a local Saratoga Peanut Butter Plain Jane Creamy for $6.49? I understand Market 32 created the space to capitalize on the trend and differentiate from their competition. Supermarkets are battling for customers! But the retailer isn’t doing local brands any favors by isolating these items in special enclaves and going against engrained shopper habits. They need to be represented in the section they belong and compete head-to-head with the national brands. Which brings up another issue: perceived value. 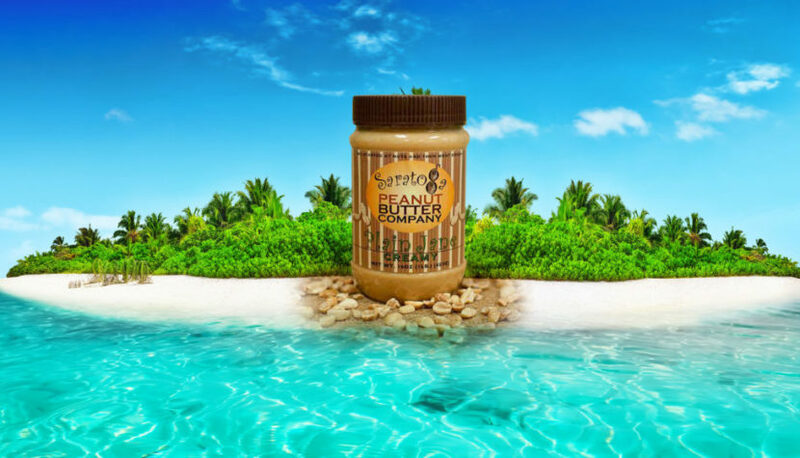 Does the customer-facing label on the Saratoga Peanut Butter tell a good enough story to help the customer justify its $4.00 price difference? To someone touring the region like me—who has zero awareness of Saratoga Peanut Butter—I am not sure this product makes it into my cart. This front-facing product label is clearly not capitalizing on the core strength of being a “Local Brand.” Also, to our trained eye the label design does not exactly scream premium. However, the side label does a great job of rationalizing the price difference. In touting an all natural, gluten free, low sodium, no sugar added, no added oils, cholesterol free, non GMO peanut, vegan peanut butter, now I know what sets it apart from the bigger, cheaper brands! The NewPoint recommendation? Move some of that side-label story to the front and guarantee that customers know what that extra $4 gets them. Whether it’s a higher quality product, the opportunity to keep dollars in the local economy or the opportunity to step into a desired lifestyle, local food brands need their stories told loud and clear–right alongside their much-bigger competitors and not segregated away in some local foods ghetto. Is the Farmers Market a Key to Growing Your Food Brand? Does your product packaging anticipate consumer needs?